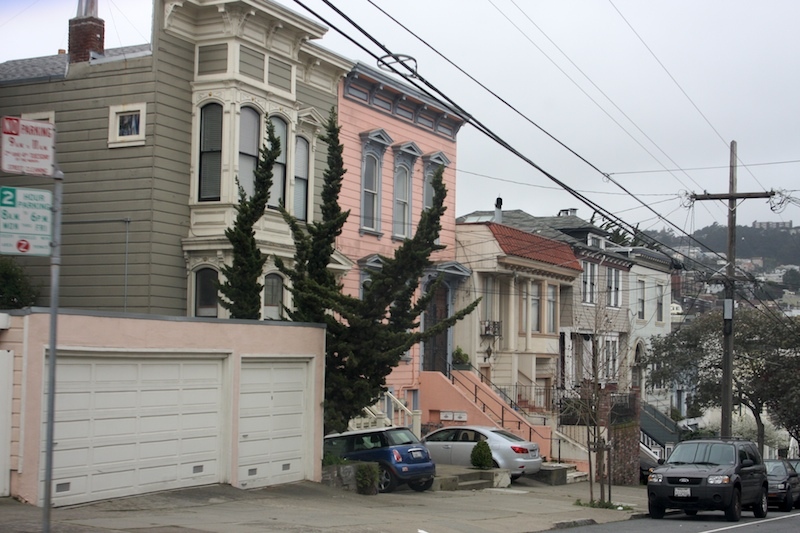 The Mission District has its gritty parts, so we've been told, but we've never really driven through the neighborhood so we decided to do a quick tour. 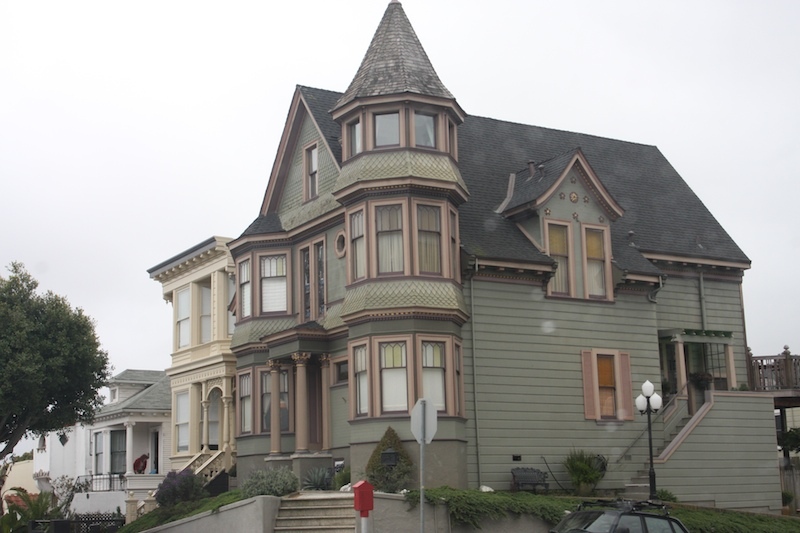 We really didn't get into the heart of the neighborhood, stayed close to Mission Delores, the Castro and into Noe Valley. And all of those areas certainly looked to be in our comfort zone of safety. Great public transportation with BART and MUNI closeby. The homes were beautiful, many historic Victorians, yards and streets well maintained. 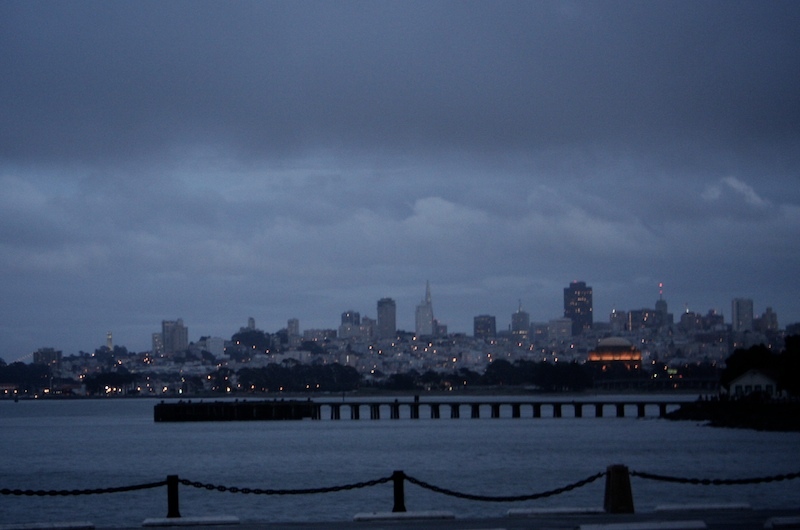 But by the time we got to the Mission District, it was really starting to rain so my photo ops were limited. 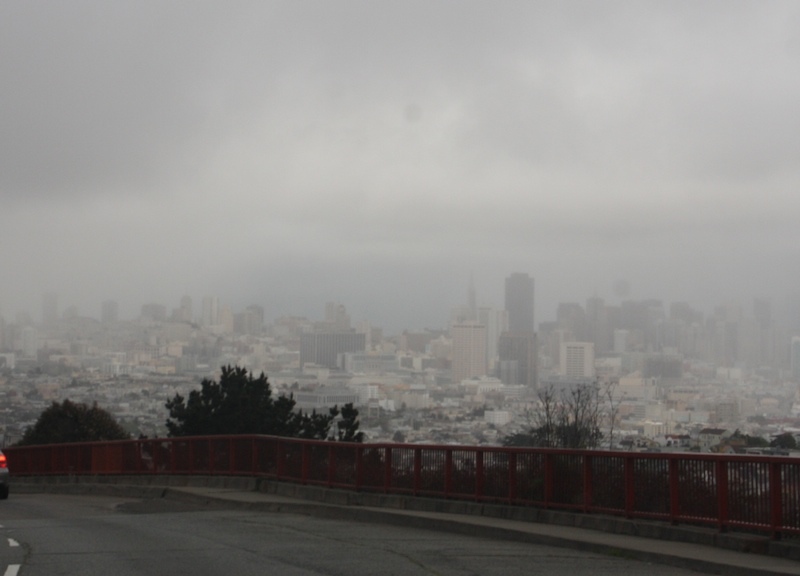 Rainy view looking towards downtown from Twin Peaks. There were several more neighborhoods we would have liked to explore but there's only so much we could do in one afternoon. But a few other neighborhoods that would be mighty fine to live in, that I didn't go into detail about because we've explored before are: the Marina, Cow Hollow, Western Addition, and the Richmond and sure why not put Pacific Heights on that list, too. In general, we would prefer to find a place in the north part of the city. As I keep looking at this cool map, I keep finding more neighborhoods that are nice. And lots of neighborhoods I've never heard of. Check here and here for a list of all or most of SF neighborhoods. Sorry folks, the Tenderloin is not on my list of most wanted. While I'm doing this quick review, I have to thank Stacey for letting me know that Nob Hill (and Russian Hill) certainly does have apartments available with a reasonable budget! I checked craigslist and it's definitely do-able. See, this is why I needed to explore the area more and with your help, I'm learning that some neighborhoods are attainable and others aren't as scary as they are reputed to be. 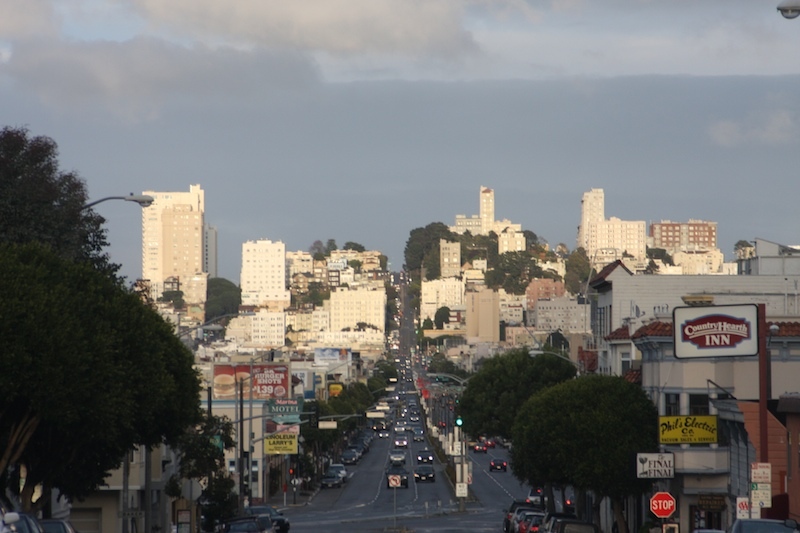 Our only peek of sun all day, shining on Cow Hollow as it turned to dusk. 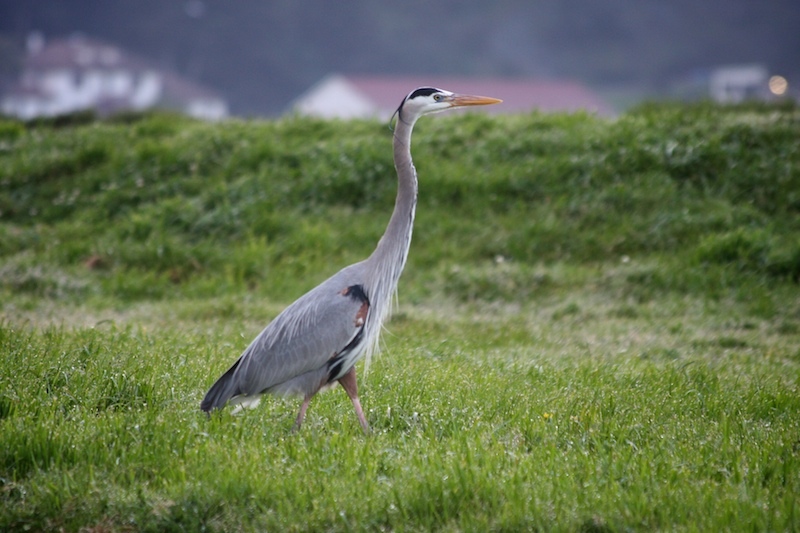 Great Blue Heron in Crissy Field. Dusk-time views of the northern parts of the city. Domed building on the right above the pier is the Palace of Fine Arts on the eastern edge of the Presidio. One last neighborhood in tomorrow's post. you are a great tour guide....wonderful photos....I left a tip in the jar by your camera. Woo! Glad you looked into it and agreed! I definitely think it's doable and a great area to live in. You take the BEST city shots!